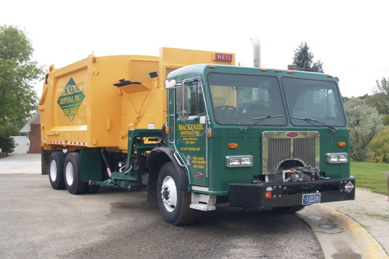 MacKenzie Disposal offers once per week residential trash service in areas outside the Billings city limits. The days of service will vary depending on your location so please call 406-259-3600 to find out exactly what your service day will be. We offer 96 gallon carts to our customers in the cost for service. During summer months an additional cart can be rented for lawn clippings for a small fee. Please set your cart at the street by 7:30 am on your collection day, no more than 2 feet from the street with the handle and wheels toward the house. The mechanical arm on the truck needs room to empty the cart. To prevent accidental damage the cart should sit 3-4 feet from mailboxes and other obstructions. To assure your cart is serviced, please avoid parking vehicles or placing other bags of garbage in front of your container. Please don’t place items you value and that aren’t intended for disposal on top of or near your container. Once they are in the truck they can seldom be retrieved without damage. Branches must be cut into 4 ft lengths and bundled. Call us for information on our yard waste collection service if you require yard waste disposal. The density of some items such as concrete, sod, dirt, apples, pumpkins, and animal waste when placed in the container make the container too heavy to lift and service and can cause damage to the container. A 12 inch wide by 12 inch high by 12 inch deep square of dirt weighs 70 pounds. For environmental protection the landfill does not accept batteries or any liquids such as paint, oil, solvents, etc. Items sticking up beyond the top of the cart prevent it from being dumped. PLEASE AVOID OVERLOADING CONTAINER! WEIGHT LIMIT IS 100 LBS. TO PREVENT THEFT OR DAMAGE TO OUR CART, PLEASE DO NOT LEAVE IT AT THE ROAD THROUGHOUT THE WEEK.The cart is and remains the property of MacKenzie Disposal Inc. Replacement cost of $75.00 will be billed to your account for any cart damaged, lost or removed from service location. Service is our number one priority so please contact the office at 406-259-3600 with any concerns or questions you may have.